Home News Episode 17 “The Crimson King” is live! The Female Titan has arrived! The Survey Corps embarks upon Operation Space Rainbow, only to encounter danger at every turn. Between titans, dysfunctional teammates, and one very rude, pissed off woman, it’ll take a new hero to see humanity through. It’ll take The Crimson King. Looks like a bumpy start for the Scouts! Who is this majestic new creature, will she become Reiner’s trap queen? 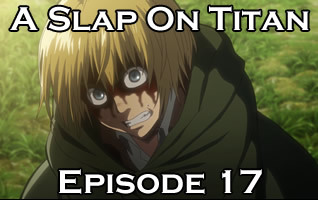 You can watch Episode 17 now, click here!